Two security guards, Paul and Grady, guard the grave of dead rock legend, Colin Fitz, on the fifth anniversary of his death. 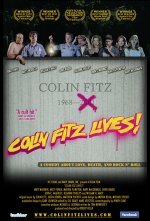 Colin Fitz Lives! release date was Friday, August 6, 2010. This was a Limited in theaters release. The film was shot in 1997, but because of limited resources, Colin Fitz didn't get distribution until 2010. Production costs were $150,000. Post-production costs in order to deliver a 35mm print to Sundance in 1997 were another $100,000. Additional costs to distribute the film, including music rights, would have cost $250,000 for a total cost of $500,000.